No matter where you are in your academic career, you will inevitably have to consider life after high school. More specifically, you will be expected to compose some sort of life goal. 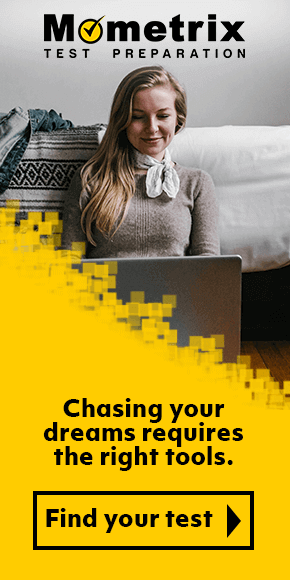 Whether you choose to move on to college, trade school, or simply join the workforce, having a basic plan can make it easier to get your life on the best possible track for yourself. If you choose to pursue higher education, you will have a bit more responsibility on your plate than other paths. Entering the university environment is a major step, and requires greater academic commitment than what you are already experiencing in high school. As such, the state of Florida wants to ensure all outgoing high school students are adequately prepared to move on to college. This is why you will be expected to complete the PERT exam before graduating high school. Before we go into detail about the PERT test in and of itself, we feel it best to first explain exactly what the test is. 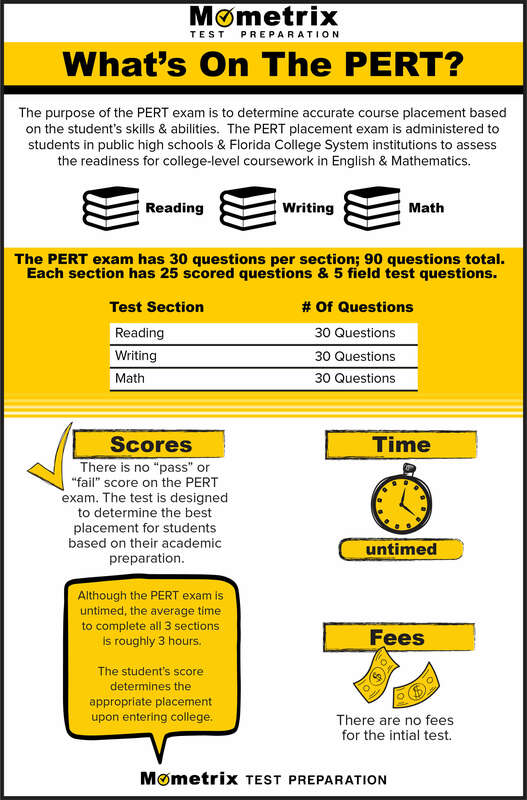 What Is the PERT Exam? The PERT test is also known by its full name: the Postsecondary Education Readiness Test. It is meant to gauge your preparedness for the college environment based on your capabilities with three core subjects: Writing, Reading, and Mathematics. You have likely gained ample experience with all three of these subjects throughout your high school career, both within your classes and on other standardized tests you have taken previously. The PERT exam will be similar to past standardized tests you’ve taken, save for one detail: there is no real scoring system for this exam. More specifically, there is no such thing as failing. Instead, you should think of PERT passing scores as a rubric of sorts. It is meant to let you know where your weaknesses and strengths lie so you can organize your college classes accordingly. You do not have to worry about time limits as you take the exam. Take all the time you need to complete the test as thoroughly and accurately as you can. The test will be presented entirely in multiple choice format, and is administered digitally. As stated above, the PERT exam splits off into three core subjects. The remainder of this page will cater to information pertaining to the PERT Math test. Percents – Questions under this category will require you to reformat a whole number into the percentage format. Order of Operations – Order of Operations questions rely on your comprehension of PEMDAS—or solving a mathematical equation by tackling the portion enclosed in parenthesis first, then the exponents, then multiplying and/or dividing before finally moving on to adding and/or subtracting. Prime Numbers – This category’s questions address numbers with no other factors than itself and the number one. You will have to memorize less than a dozen prime numbers—or ten, to be specific—and be able to identify them on sight. Exponents – Questions under this category will refer to a specific type of numerical notation that you have likely witnessed before: numbers with exponents written next to them, such as 53 or 72. In this case, the smaller number represents how many times the larger number must be self-multiplied. You may have to figure out the exact value of a variable exponent as part of a larger algebraic equation. Coordinate Planes – Ths category’s questions will examine the relationship between equations and line coordinate graphs. You may be expected to solve an algebraic question based on a pair of grid coordinates and the line they would create in order to find that line’s equation. Polynomials – You can think of polynomials as more complex versions of simple algebraic equations. They will contain more than one algebraic equation at once, which you will have to solve using the Order of Operations method. Equations – This category refers to the simplest part of Algebra: equations. This type of mathematical notation will feature heavily throughout the PERT Math exam. Because so much of the exam consists of subjects you’ve become familiar with throughout middle and high school, it may be easy to assume you’ll have little to no studying to do. However, you don’t want to get too comfortable! Studying for this exam can only boost your chances of success, especially once you have the right PERT test prep tools at your disposal. On this page, you will find our two main resources for the PERT test: our PERT Math study guide and our companion PERT practice test. These tool s are designed to better familiarize you with the contents of the official PERT exam, so you aren’t hit with any surprises on test day. Our PERT Math practice test is especially well-suited for those who are interested in gaining an up close glimpse of what to expect from the exam. We have conducted careful and thorough research involving older editions of the PERT exam, all to provide you with a more interactive example of the test that is as accurate as possible. 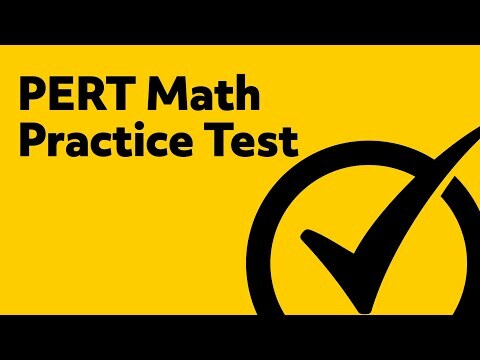 We encourage you to use our PERT practice test for Math as both a means of getting to know the ins and outs of the exam, as well as a way to gain a better sense of where your weaknesses and strengths lie with the material. That way, you can better focus your study efforts so you can do even better on the exam. The PERT study guide for Math is more like a road map for those who have hit a dead end in their study plan or who simply have no idea which route to take. 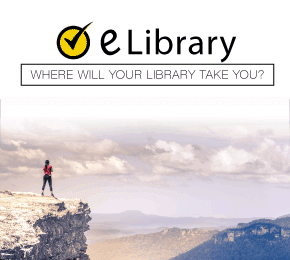 It contains more detailed descriptions of each component of the exam, as well as example questions with answers and explanations for you to refer to. We hope both of these PERT Math practice tools will serve you well as you prepare for this exam. Good luck!